Axon Ligands™ are a unique collection of biological molecules, as world-wide recognized research tools and drug standards in different application fields such as neurological disorders, cardivascular disease, pain and inflammation, and cancer. Featured ligands with our expertise including CNS reagents, ion channel modulators, signal transduction regulators (such as kinase inhibitors) and much more…. 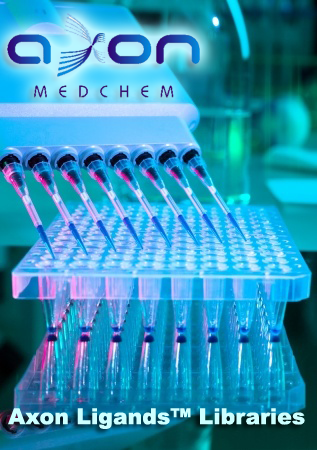 Axon Medchem can offer you compound libraries for High-throughput screening (HTS), providing wide coverage of the most important targets in biochemical and cellular screening assays in modern drug discovery. The libraries are available either as accurately weighed powder samples (1-2 mg) in glass vials or concentrated stock solution in DMSO, such as 10 mM stock solutions in DMSO (100 μL, 250 μL) in 96-well plates (Matrix 0.5 ml tubes with 2D barcodes). Axon Custom compound Library of your research interest: your selection of tool compounds from the Axon Ligands™ catalogue. Moreover, Axon Medchem can also offer you specific sets of Axon Ligands on specific pharmacological targets.